When a lender like a bank extends a loan to a borrower, provisions will be made for the borrower to repay the loan amount some time in the future or in parts periodically. At the same time, the lender will expect to receive interests from the borrower as a reward of undertaking the risk to lend out the money. When the loan amount is repaid by parts over a certain amount of time, the loan is called an amortized loan. A borrower will typically be interested in knowing how much he will have to pay periodically if he takes up a loan of a certain amount over a certain period of time. Other information like how much total interest he will have to incur, the total principal loan amount outstanding at a specific point in time and whether he will be able to afford the loan if he shorten the total loan period will also be of interest to the borrower. All these information can be easily illustrated using a Loan Amortization Schedule. The aim of this document is to describe the use and customization of the Loan Amortization Schedule spreadsheet provided by ConnectCode. It assumes that you have some basic knowledge about loan amortization, Microsoft Excel and Microsoft Visual Basic for Applications. The LoanAmortizationSchedule.xls Excel spreadsheet can be used to easily generate a complete Loan Amortization Schedule. This section describes the basic information on using this spreadsheet quickly and effectively. It also covers more advance topics like catering for additional payments of the loan and performing a Sensitivity Analysis over varying interest rates for the loan schedule. A loan amortization schedule usually takes the following inputs. Beginning Date – The date where the loan is taken. Payments are assumed to start 1 period after the Beginning Date. Loan Amount – The amount that the lender will loan to the borrower. Annual Interest rate – The interest rate per year. Payment Period – The total number of payment periods. This depends on the Payment Frequency field below. If Payment Frequency selected is “Annually” and Payment period is 10, it means 10 years. If Payment Frequency is Monthly and Payment Period is 12, it means 12 months. Payments Frequency – This specifies the frequency the loan repayments take place. Once the inputs are keyed in, the loan amortization schedule will be generated automatically. All the fields marked with ‘*’ are the input fields. By default, up to 127 payments schedules are supported. 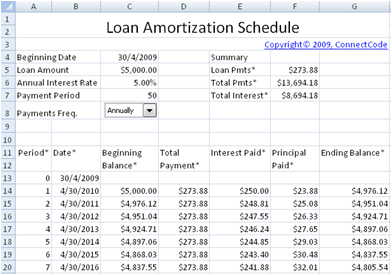 The screenshot below shows how the amortization schedule will look like.